As a sophomore in 1967, McKay was an un-lettered reserve tackle playing behind future pro Howard Fest. Then in 1968, spring practice was a grueling affair with more contact drills than normal. Several players quit and others were injured including a shoulder injury to McKay from the intense practices. But the result was that the team grew closer together. The 1968 season ended with nine straight wins, including a Cotton Bowl victory and a number 3 finish in the final poll. 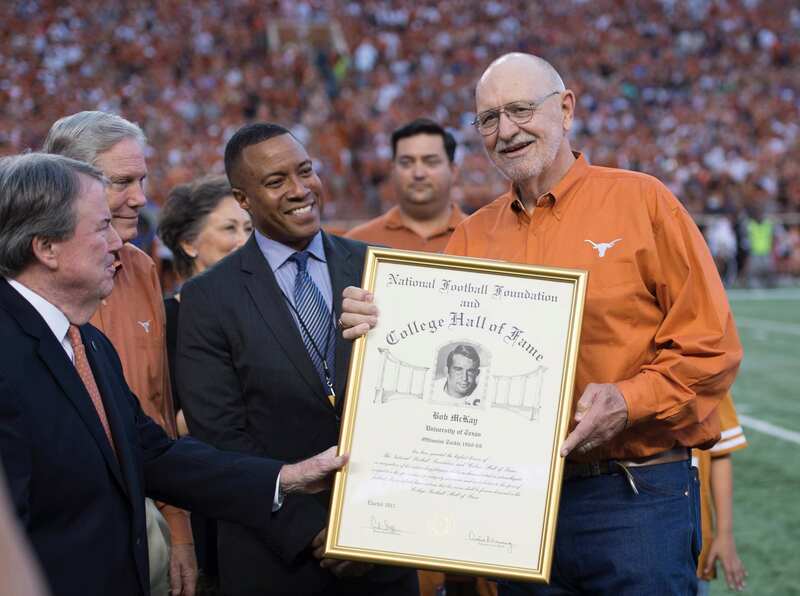 The success of 1968 rolled into McKay’s 1969 All-America senior season, with the Longhorns winning streak reaching 18 games going into a #1 vs #2 matchup with second ranked Arkansas. Trailing 14-0 in the 4th quarter, Quarterback James Street scrambled for a 42-yard touchdown with McKay throwing the key downfield block. The play sparked the Longhorns as a two-point conversion and additional touchdown gave Texas a 15-14 win. Less than a month later in a Cotton Bowl matchup against Notre Dame, Texas would need to rally again in the 4th quarter as they trailed 17-14 with seven minutes left to play. A 76-yard 17-play drive, that featured two 4th down conversions consumed nearly six minutes of playing time cumulated with a one yard touchdown clinching the national championship. McKay would go on to be drafted by Cleveland in the first round of the NFL draft. There he would start for five of six seasons before ending his career with New England.